You'll be £10.00 closer to your next £10.00 credit when you purchase Blue Diamonds. What's this? In the seven decades since the Second World War, 14 Squadron has operated a wide array of aircraft types (Mosquitoes, Vampires, Venoms, Hunters, Canberras, Phantoms, Jaguars and Tornados) in a fascinating variety of roles. For much of this time, the Squadron was based in Germany at the front line of the Cold War, but it also participated in the Gulf War in 1991, in operations over Iraq from 1991-2009, in the Kosovo conflict in 2000 and latterly during the war in Afghanistan, firstly with the Tornado GR4 and then with the Shadow R1. Today the Squadron operates in great secrecy in an Intelligence, Surveillance, Target Acquisition and Reconnaissance role. Having had access to log-books, contemporary diaries, maps and photographs, as well as oral and written accounts from a large number of ex-Squadron members, the author has been able to produce as complete an account as is presently possible of the operational history of 14 Squadron in the second half of the twentieth century and the opening years of the twenty-first. The author has conscientiously collected in this book all weapon facts from the 14th squadron of the RAF in the 1945-2015 period. Who else can do this better than Michael Napier, who himself has served a long time at this squadron and has written a beautiful book about that time (Tornado above Tigris). This book however is very different. From the founding of the squadron in 1915 till present time, the Blue Diamonds, as the squadron is called, have registered a lot of weapon facts on their behalf, but the author has limited himself till the period of after WWII. ... It is a beautifully bound book, very well organised, 320 pages with very many pictures, cards and drawings of the used air plane types. Plus in the back an appendix with background of the mentioned crew members and the air planes that were deployed in this period. This book is a historical document, especially recommended for everyone who has served in this period at the 14tht squadron, but also for other aviation enthusiasts. It also gives, in particular, a good insight in the day to day operations at squadron level throughout the years, especially in the period of the Cold War and the wars in the Balkan, Afghanistan and Iraq. The author served with 14 Squadron and was appointed Honorary Secretary of the 14 Squadron Association. Now an airline pilot, he has undertaken careful research to produce an accurate account of the career of 14 Squadron from the end of WWII to 2015. Complete accounts of this kind provide definitive books on their subject and will not only sell well to a defined readership on publication, but continue to be sought-after reference works for many years to come. The text is well-supported by an excellent selection of illustrations, including maps, photographs and full colour drawings. The text flows nicely and encourages the reader to work through the book. Recommended. ... This is a book that needed to be written and deserves to be widely read. In producing this interesting history of a single squadron in the RAF, the author has painted a picture of the military scene as it has developed and changed in the period since WWII. This is an excellent account of the activities of an operational squadron during the Cold War and its aftermath and is full of interesting details and photographs. Thoroughly recommended. Mike Napier is to be congratulated on producing such a comprehensive history of the RAF's longest-serving and most important squadrons... This is an excellent squadron history and those with an interest in RAF history will find it a fascinating read. Recommended. Richly illustrated, this is a handsomely presented work of historical and even social reference. Most strongly recommended. This is an excellent book, full of interest and well-produced - a fitting tribute to No 14 Squadron in its centenary year. A superb unit history, skilfully weaving historical overview with reminiscences from squadron members. The well-balanced text is complemented by extensive footnotes, appendices and references as well as a comprehensive list of serial numbers. Camouflage and marking notes and colour profiles should interest historians and modellers alike. Squadron history books fall into two categories. On the one hand they can be highly detailed - but very 'dry'. On the other hand they can be a brilliant collection of personal exploits detailing what life was really like on an operational squadron. This latest book from Pen & Sword definitely falls into the latter category and can only be described as an outstanding tribute to 14 Squadron, nicknamed the 'Blue Diamonds'. It's the personal accounts that make this book stand out from similar titles out there. A brilliant read. As with Volume 1, Michael Napier offers a model squadron history. He has skilfully woven the essential historical overview with numerous and valuable personal reminiscences from squadron members. This well-balanced text is complemented by a comprehensive photographic coverage covering both 'men and machines' many of which are previously unpublished. This excellent book is of interest to historians, enthusiasts and modellers alike - and, most importantly, 'those who were there'. 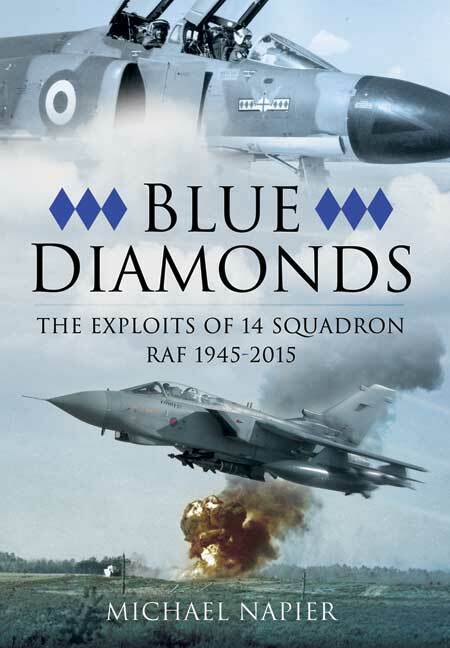 As 14 Squadron prepares to celebrate its centenary...'Blue Diamonds'...delves into its long and fascinating history. The son of an army officer, author Michael Napier joined the RAF in 1978 and served with 14 Squadron as a Tornado pilot. He was appointed honorary secretary of the 14 Squadron Association in 2003 and since then has carried out extensive research into its heritage. This collection of human interest stories is compiled from around 100 people Napier interviewed. As featured in the Banbury Guardian. As featured in the Shoreham Herald. Pilot Michael Napier details the history of 14 Squadron RAF over the course of the last 70 years...It is a follow up to 'Winged Crusaders'. The elder son of an army officer, Mr Napier joined the RAF in 1978 and served with 14 Squadron as a Tornado pilot. In the seven decades since the Second World War, 14 Squadron has operated a wide array of aircraft types in a fascinating variety of roles.